In-depth research report on “Electric Bikes Market: Global Industry analysis (2012-2016) and Forecast (2017-2022)” covers extensive analyses on several aspects of the electric bikes market to give the reader an exquisite feel of the market in a nutshell. It covers various market dynamics influencing the market which can be used to devise strategies to stay ahead in the dynamically changing market picture. The research carried out for analyzing the electric bikes market follows an exclusive research methodology which increases the accuracy percentage by reducing the deviations to a great extent. The one of its kind research methodology follows a repetitive pattern wherein each data point of every single parameter of each and every segment is evaluated multiple times and then the re-validation offers extremely higher accuracy with reduced errors. There is no room for miscalculations due to such a streamlined and structured research process. The method of triangulation raises the credibility bar, definitely improving the quality of the research. Managed by domain experts, the analysts have crafted the electric bikes market research report in such a way that it can be easily understood owing to simple yet matchless report structure. Benefit with a seamless research perspective! The comprehensiveness of the electric bikes market research report is proven as it covers every single angle present in every single segment and sub-segment of the global electric bikes market with respect to each sub region of important geographies. The weighted intelligence around various aspects such as market shares, supply and demand side analysis, revenue and sales, product innovations, product portfolios, marketing strategies, mergers and acquisitions, competitor analysis, forecasts, etc., is included in the electric bikes market research report and it does bring a holistic touch to the research report. The reader can get a broad idea regarding implementation of marketing strategies in order to achieve informed growth in the years to come. The geographical cover up includes intelligence on important landscapes of North America, Europe, Latin America, Asia-pacific excluding Japan (APEJ), Japan and Middle East and Africa (MEA). Each of these geographies are further sub-categorized and accessed. Several aspects are analyzed which have an impact on the electric bikes market growth and the opportunities and threats that these regions possess. Moreover, the macro economical aspects, trends, drivers and challenges are also discussed in this research study. The global electric bikes market research report dedicates an entire research chapter on competitive intelligence, which reflects key details of various tier companies involved in the electric bikes market. The details such as company overview, product portfolio, SWOT analysis, key innovations and developments, key financial intelligence of these key players have been included in the research study. Electric bikes, also referred to as e-bikes, are fitted with an electric motor which is used for gaining momentum. They make use of chargeable batteries, which have different capacities depending upon their size. Electric bikes are classified on the basis of the power of electric motor on which they run. Peddle assist, throttle on demand, speed pedelec and electric moped or motorcycle are the different categories of electric bikes. Persistence Market Research has highlighted several key insights in its new research report on global electric bikes market. This research publication uncovers several aspects of the electric bikes market, giving analytical acumen and forecasts with respect to the growth of the electric bikes market during the period of 2017-2022. 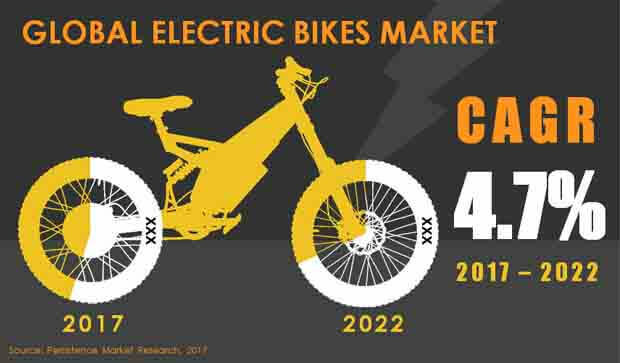 As per this exhaustive research report, the global electric bikes market is witnessing moderate growth and is projected to register a CAGR of 4.7% during the forecast period of 2017-2022. A combination of various macro-economic and micro-economic factors continues to shape the global electric bikes market. Consistent advancements in technology have enabled the development of comfortable, environment-friendly electric bikes. Demand for electric bikes is also positively influenced by increasing awareness among consumers about the need to reduce their carbon footprint. Extended government support and implementation of strict rules in various geographies has pushed the sales of electric bikes. In metro cities, especially in North America and European countries, the concepts of public charging infrastructure and rental service for e-bikes is on the rise. Increasing investments on the research and development by several market players, to develop new high efficiency batteries and manufacture high performance vehicles has played a crucial role in fuelling the adoption of electric bikes. Moreover, manufacturers are pushing sales of electric bikes by positioning their product as environment friendly, which not only reduces air pollution but also has the potential to considerably reduce the greenhouse effect as they reflect low tailpipe emissions. However, certain factors pose challenges to the growth of the global electric bikes market. Electric bikes are highly priced and cannot be afforded by all. As these bikes run on batteries, they require frequent charging – this remains a challenge owing to the limited number of charging stations. Also, maintenance of the product is of utmost importance, which also requires proper charging infrastructure. High maintenance cost is another key factor that dissuades consumers from buying electric bikes. Class 3: speed pedelec segment is anticipated to grow at a robust rate during the assessment period. This segment is poised to reflect a CAGR of above 5% and a significant market share by 2022-end, thus gaining high momentum in the coming years as it outpaces other segments in the product type category. The main reason for the growth of the speed pedelec segment is related to health, noise and air pollution. People are aware of health benefits when using speed pedelecs; they are able to toggle from manual propulsion to electric as per requirement. Speed pedelecs operate silently and do not emit harmful gases. They have high capacity and can achieve high speeds due to electric assistance. By region, the Asia-Pacific excluding Japan (APEJ) region is expected to lead the global electric bikes market. The APEJ region is expected to continue to remain attractive for electric bikes and it is anticipated to lead the global electric bikes market. Countries like China and India have shown high contribution in the growth of APEJ region. China has seen higher consumption of electric bikes, which has boosted sales figures, thus impacting the growth of the global market. In India, the government has encouraged the use of electric bikes, and it is looking forward to convert each and every “fuel-running vehicle” into electric vehicles by the end of 2035. Europe and North America are other key markets for electric bikes. A number of electric bike manufacturers are headquartered in these two regions. Europe and North America have remained at the forefront of innovation in electric bike technology. The electric bike market in Europe and North America is projected to grow at similar rates during the forecast period. The global electric bikes market research report has profiled key players in the market. Companies such as Robert Bosch GmbH, Accell Group N.V, Giant Manufacturing Co., Ltd., Derby Cycle Holding GmbH, Jiangsu Xinri E-Vehicle Co. Ltd., Panasonic Corp, Bionx International Corporation, Mahindra & Mahindra Ltd., Samsung SDI Co., Ltd., and Prodeco Technologies Llc are profiled in this market study.